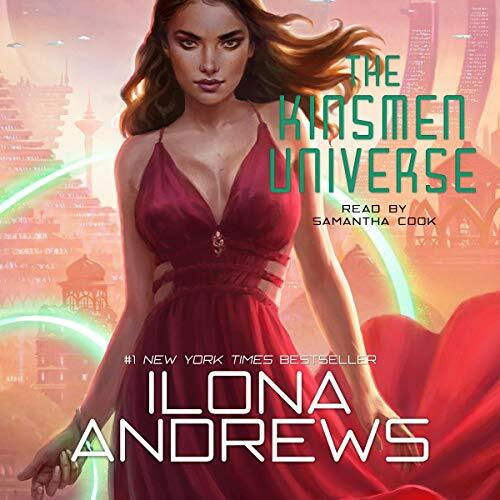 This is an anthology edition of the Kinsmen Universe, which includes Silent Blade and Silver Shark, plus a new short story. Family is everything. Talent is power. And revenge is sweet. In a distant, future world Kinsmen - small powerful groups of genetically and technologically advanced families - control vast financial empires. They are their own country, their own rulers, and their only limits are other Kinsmen. The struggle for power is a bloody, full-contact sport: in business, on the battlefield...and sometimes in the bedroom. On the planet Rada, Meli Galdes' family is of minor rank, and were relying on her marriage to Celino, the razor-smart, ruthless leader of the powerful Carvanna empire. When he abruptly breaks their engagement, he ruins her family and guarantees that Meli will never marry, as no suitor will oppose the rich and influential Carvannas. But Meli has a rare, secret, lethal - and valuable - talent. As a melder of energy, she's capable of severing anything in her path. So she "leaves" her family and trains to become one of the best and most lethal of assassins, all the while covertly guarding her family's interests. Now she's ready to quit; but she has one more assignment. To kill the man who ruined her life. Claire Shannon is a killer...and her weapon is her mind. Born on a planet torn by war for over 300 years, Claire is a soldier: a psycher, with the ability to read, control, and destroy the minds of enemy psychers and to infiltrate the biological network where they battle to death. When Claire's faction loses the war, she barely escapes extermination from both sides, as her talent brands her as too dangerous to society. By so-deeply burying her ability that she avoids detection, Claire is instead deported to Rada as a refugee, where she must find work to remain. She finds a job as personal assistant to Venturo Escana, a premiere kinsman; one of Rada's most wealthy entrepreneurs - and most powerful psychers. The leader of the fierce Reigh people expires during an intergalactic summit, putting 30 million colonists' lives and livelihoods in jeopardy. When the new heir to the Reigh throne, Lord Nagrad, demands restitution, the phrase "'a life for a life" turns the intergalactic calamity into an arranged marriage contract between Lord Nagrad and sharply intelligent diplomatic analyst Deirdre Lebed...and the negotiation of terms becomes anything but formal!